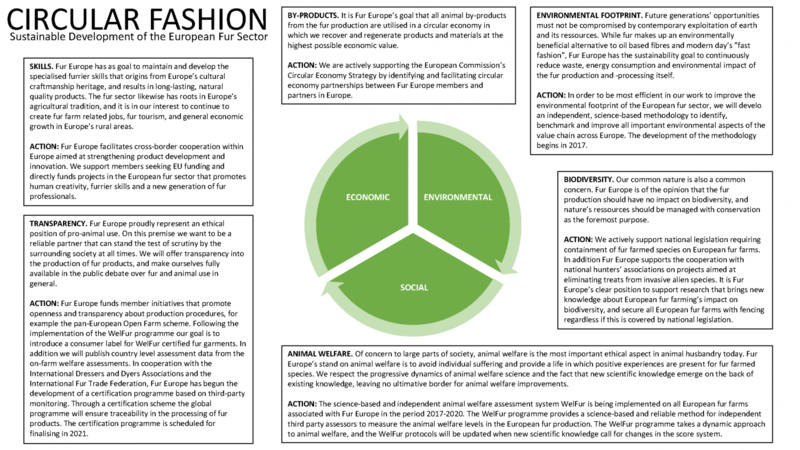 January 23, 2017 - Circular fashion is at the core of how European fur sector sees itself 5 years from now, states Fur Europe's 5-year vision recently adopted by the Fur Europe Board. Click on the image for full details about the Circular Fashion vision. Circular fashion is at the core of how European fur sector sees itself 5 years from now, states Fur Europe 5-year vision adopted recently by the Fur Europe Board. The new concept of Fur Europe combines six different areas of sustainability in a 5-year vision that includes topics such as by-products, environment, biodiversity, animal welfare, transparency and skills, along with a set of concrete goals. The aim is that the Circular Fashion vision will serve as a roadmap to the sustainable development of the sector in the coming years. The certification programme WelFur is set as one of the pillars of this sustainable development. However, by end of 2017 Fur Europe will launch a new ambitions project – an independent science-based methodology aiming to identity, benchmark and improve environmental aspects of fur value chain. ‘’Fur is known as an environmentally beneficial alternative to all oil-based fibers and today’s trend for ‘’fast fashion’’. Many innovative practices have already been adopted in this regards, but we want to take these efforts to the next level and develop a fully functional scientific method measuring the environmental impacts,’’ said Fur Europe Chairman Kenneth Ingman. 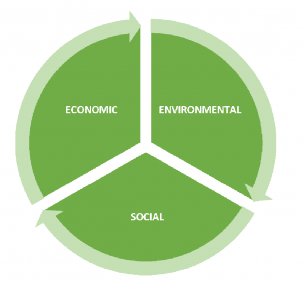 In addition to the social and environmental aspect of the sustainability agenda, the economic aspect remains an important focus. ‘’When it comes to sustainability the economic side of the concept is often neglected. We see sustainability going way beyond the environmental side. Sustainability means jobs, economic progress and responsible, open and transparent development of a sector that has long history in Europe’s agricultural tradition,’’ Mette Lykke Nielsen added. The role of fur as part of the circular fashion trend, which is gaining popularity across Europe, will be reassured by the developing a WelFur label for fur garments and a new certification scheme that will guarantee traceability and transparency of fur garments production. ‘’Five years from now we want to have a fully functional animal welfare assessment system, a methodology that helps us measure and improve the environmental footprint of fur production and the comfort to know that people behind fur across Europe have jobs and security,’’ concluded Mette Lykke Nielsen. The Circular Fashion vision enters into force from 2017 and by the end of 2022 all the objectives should be accomplished. Click here to find all details about the Circular Fashion Vision.